Nice review. This is one of my favorite westerns and the scenery is pretty amazing. Thanks! Yeah, Ford sure made good use out of Monument Valley. What a beautiful area. This movie really is a lot of fun. Probably my favorite Western from the thirties. I can’t say I have seen many Westerns from that era, but I really enjoyed this one. I watched this in a Western Lit class in 11th grade. Excellent film. Glad you got around to seeing it; your review is spot-on. Thanks, Morgan. What a great film to see in class. And a 3.1 rating to boot. I wonder what on earth made your teacher choose that one..? He thought it was hilarious. And the little clip he showed was. One of those purposefully so-bad-it’s-good movies. I still mean to check out the full film one of these days. Great review of one of my all time favorite Ford movies. Isn’t that Ringo introduction just priceless? Whatta zoom shot. I agree, not a fault to be found here. Thanks, man. Yeah, that intro was just perfect. Immediately set the tone that Ringo wasn’t someone to be messed with. Excellent choice and insightful critique! 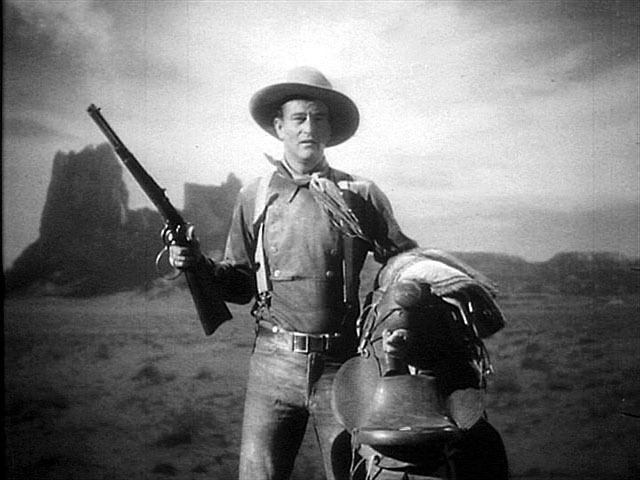 ‘Stagecoach’ is essential early John Wayne. Not only to watch and savor Monument Valley and dusty surroundings, But to catch the first grasps of an actor creating a persona and the makings of a legend. While taking note of a template for later westerns that would be returned to again and again and swell the genre. Thanks, Jack! Your recommendation was a big reason that I included this in the project, so thank you for that! Nice review of a great film. I wish the Native Americans weren’t so demonized in these old westerns, but you can’t change history. In any case, I grew up watching John Wayne and this was always one of my favorites. I’d also recommend Red River if you haven’t seen that one. I think my first comment got lost on the superhighway somewhere. Anyway, I had said this was a nice review of a great movie, and that it bothers me that these old movies demonize the Native Americans so much, but that you can’t change history. At least a little bit later (1950s) there’s people like Sam Fuller who made socially progressive movies that stand out distinctly from stuff like this. Anyway, I grew up watching John Wayne and this was always one of my favorites. I’d also recommend Red River if you’ve never seen that. One of Wayne’s best performances. And of course, there’s the other one right after I post this one. Hahaha. Hi Will, thanks for the comment(s)! 😀 I know WordPress can be finicky at times. But yeah, I completely agree with you on these old Westerns and their terrible characterizations of Native Americans. 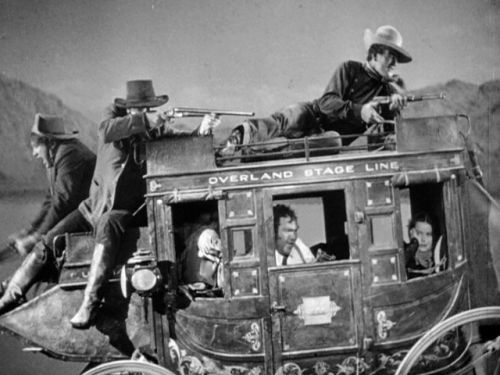 At least Stagecoach wasn’t as blatantly racist as The Searchers — that film’s entire subplot involving the Indian wife was just embarrassing. I’ll have to go for Red River with my next Wayne film. Thanks for the rec! Eric, it’s so great that you got the chance to watch Stagecoach. I think that it’s one of those movies that anyone who’s going to delve into Westerns should check out. The first reveal of John Wayne is such a classic moment; it’s like Ford decided “I’m going to make him a star” and designed a movie around it. Wayne’s career was not in good shape, and this film got him rolling towards stardom. You mention that the Native Americans were just portrayed as savages. While that is true, I think of them as really just another external obstacle for the group to overcome. This doesn’t let Ford off the hook, but it seems less nefarious then some other examples from the genre. Hi Dan, that’s a great observation about Wayne’s introduction. That zoom-in pretty much set the stage for him, and he took the ball and ran with it. Hell of an intro. As far as the Native Americans, at least this film wasn’t quite as blatantly racist as The Searchers. I still can’t get over how terrible that “Indian wife” subplot was. Great review Eric, but sorry to say but I’m not too fond of John Wayne for some reason. Btw, I just saw a great classic All About Eve, oh my, how could I’ve missed this film for so long! Yeah, I can see how Wayne would rub some people the wrong way. I didn’t have a high opinion of him at first either, but I have really enjoyed him in Stagecoach and The Searchers. All About Eve is a good one! Glad to hear you enjoyed it. Will you be writing about it soon? I’m still overwhelmed by how good it is to write a full review, but maybe a short one for the Weekend roundup. Cool! I’ll look out for it tomorrow then. Hi David, thanks for the comment. I wasn’t aware about the 1989 remake — that sounds awful! Ditto for the colorized version of the 1939 film. Such a shame that Hollywood felt it necessary to mess with this classic, not once but twice! Did I say song. 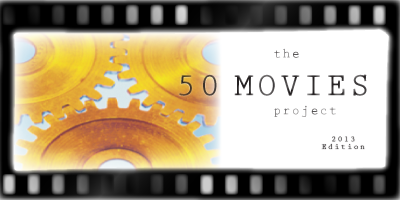 I meant movie. D’oh!